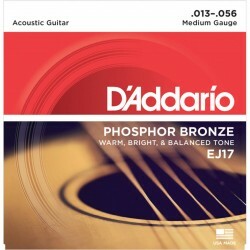 D'Addario EJ17 phosphor bronze acoustic guitar strings. Guage 13-56 is one of the most popular sets ..
D'Addario EJ16 phosphor bronze acoustic guitar strings. Guage 12-54 is one of the most popular sets ..
D'Addario EJ26 phosphor bronze acoustic guitar strings. Guage 11-52 is one of the most popular sets ..
D'Addario EJ15 phosphor bronze acoustic guitar strings. Guage 10-47 is one of the most popular sets ..